Unfortunately for me, I read this book many years after it's publication and after the release of "A Well Paid Slave," which made this book uneventful, but no less enjoyable.I'm certain that had I not read the other books about Flood or knew little about his story it would have been an amazing and outstanding book. This is no fault of the author as the book is a solid work and a nice concise account of Floods life and career. 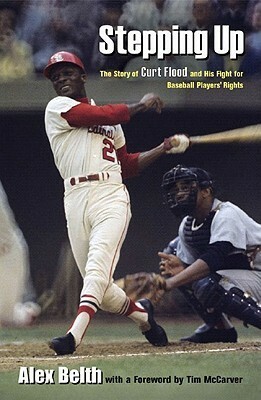 Curt Flood was an outstanding center fielder for the St. Louis Cardinals in the 1960s. His baseball career was cut short by conscience, not injury. When he was traded after the 1969 season, he refused to report to his new team and mounted a legal challenge to baseball's reserve clause, which bound a player to a team forever, unless the team chose to trade or release him. Flood sat out the 1970 season while the case wound its way to the Supreme Court, where he lost. But Flood's challenge eventually paved the way for what is now known as free agency, the vehicle that has made millionaires of even journeyman major leaguers. Belth's biography recounts Flood's modest youth, his minor-league stops in the Jim Crow south, and his stellar major-league career, homing in on the circumstances and personal characteristics that would lead him to the role of trailblazer. He retired from the game at the young age of 32, deeply hurt by the animosity he encountered, even among some of his shortsighted peers. An incisive portrait of an underappreciated baseball icon.